It seems that malicious Google Chrome extensions are on the rise. A couple of months ago, I posted here about two of them  which stole user credentials posted on banking websites and alike. Now, while analyzing a phishing e-mail, I went through a new malware with a slight different approach: instead of monitoring specific URLs and focusing on credentials, it captures literally all data posted by the victim on any website – thus the name. 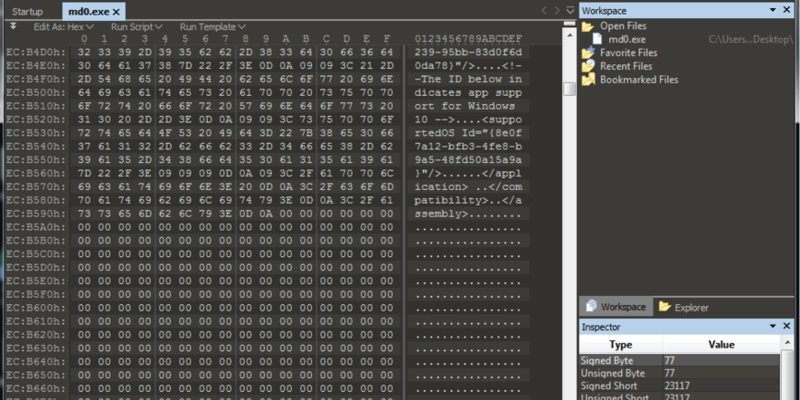 In today’s diary, I’ll detail the aspects of “Catch-All” malware that caught my attention. 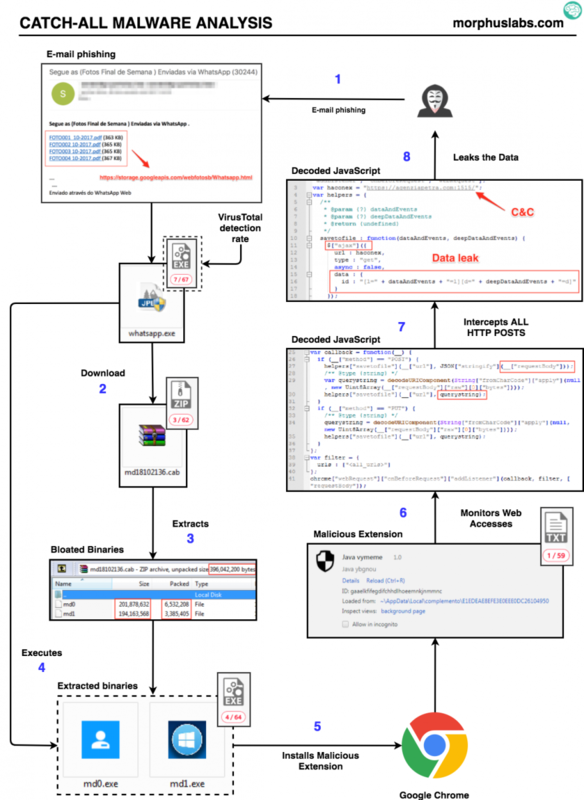 Let’s start with the threat analysis diagram in Figure 1 followed by the text description in section 2. Following any “photo” link, the victim will download the malware dropper file called “whatsapp.exe”. 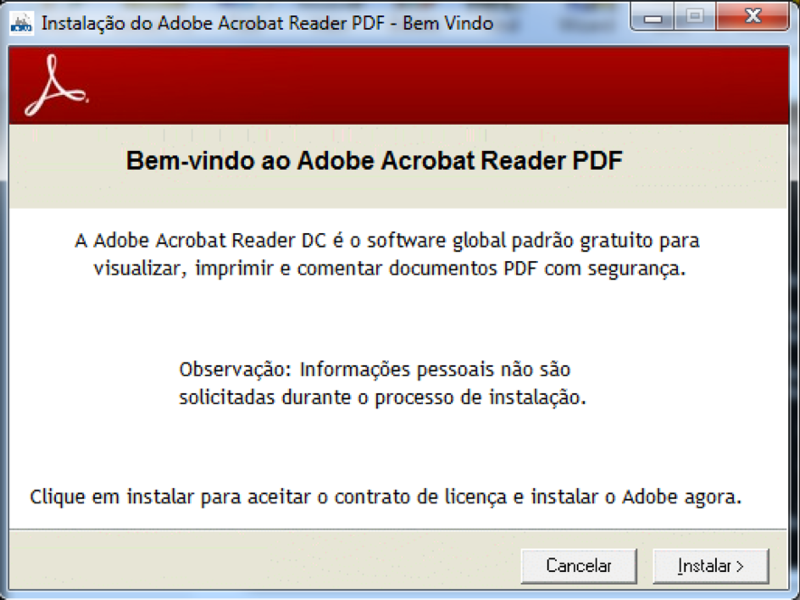 Once executed, “whatsapp.exe” will present a fake Adobe PDF Reader install screen, as seen in Figure 2, while downloads, unzips (output are two files, md0 and md1) and executes a “.cab” file called “md18102136.cab”, as seen in Figure 3. The “md18102136.cab” file is a ~9.5 Mb zip compressed that, after uncompressed, will result in two very large files of ~200Mb each as shown in Figure 4. Looking at the content of those binaries, it was possible to see that just ~3% of them had actual instructions, as seen in Figure 5. The rest are “NOP” code to bloat the file – possibly as a strategy to bypass anti-malware solutions that usually do not inspect large files. 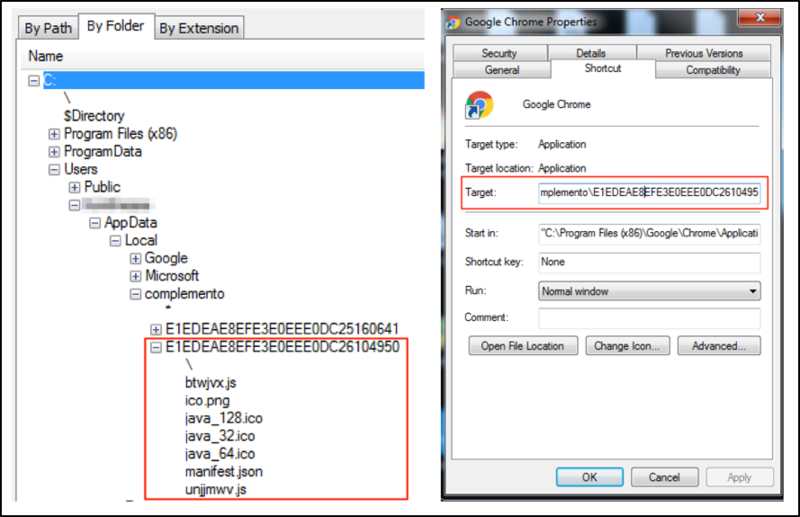 Once executed, “md0” will attempt to disable Windows Firewall and kill all Google Chrome processes in order to install the malicious extension, as seen in Figure 6. It then extracts from itself a Google Chrome extension and changes Google Chrome launcher (“.lnk”) files to load it on the next execution, as seen in Figures 7. Note that, additionally to load the extension, it disables important security features that could avoid malicious extension to work properly. --disable-extensions-file-access-check: disable checking for user opt-in for extensions that want to inject script into file URLs (ie, always allow it). This is used during automated testing. --always-authorize-plugins: prevents Chrome from requiring authorization to run certain widely installed but less commonly used plug-ins. The function “savetofile”, as seen in Figure 9, will send the captured data to a C&C server using jQuery ajax connections. Debugging the extension while trying to log into Gmail, it was possible to see the content that would be sent to C&C server, as shown in Figure 10. So, using such approach, an adversary would be able to capture high sensitive data with not much effort compared to standard methods. It wasn’t necessary for the attacker to attract the victim to a fake website with doubtful SSL certificates or deploying local proxies to intercept web connections. Quite the opposite, the user is accessing original and legitimate websites and all the interactions are working properly while data is captured and leaked. In other words, this method may subvert many security layers the victim may have in place. 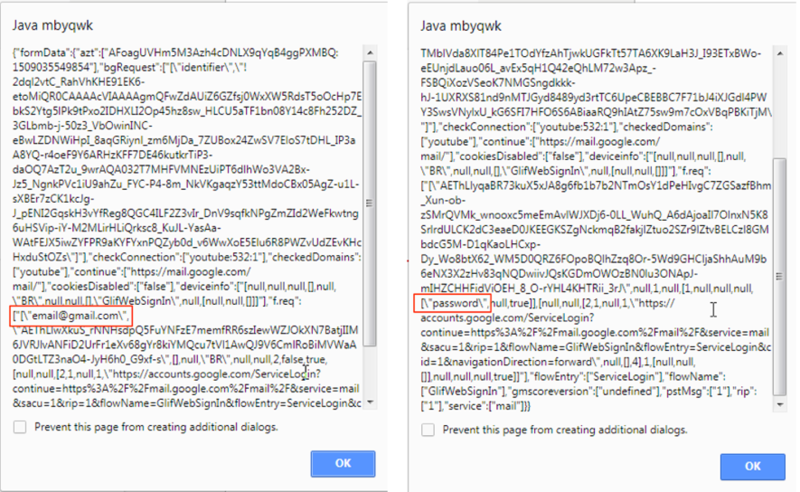 As I mentioned in previous related posts, it sounds strange to me Google Chrome allowing extensions access sensitive form fields, like passwords, without asking for an additional user’s approval, as well as allowing an extension to silently and autonomously stablish a connection to an external entity. Additionally, browser security features that could protect user from harmful extensions can be disabled through command line arguments as in this case. Should non-tech savvy users be able to programmatically deploy rogue extensions? Comparing it to Android or iOS ecosystems, it is like allowing users to easily deploy apps not offered by official stores or another safe channel. What do you think?